A LITTLE FRIDAY FUN HERE. Forget golf for a moment and consider paddleboarding with, yes, PGA champion and former Ryder Cup captain Davis Love III. 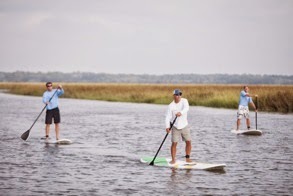 On September 14, Sea Island resort in Georgia is giving locals and guests the rare and exciting opportunity to meet and go on a paddleboarding adventure with one of golf’s most celebrated champions, Davis Love III. Hosted by Davis Love III himself, the “Off the Dock with Davis” event will take place from 3-9 p.m., starting at Village Creek Landing on St. Simons Island and concluding at Sea Island’s Rainbow Island, where a luau-style party will await. Participants will be able to interact with one of the greatest golfers in the country in a serene setting devoid of balls and clubs. Tickets are $65 for adults and $25 for children, which includes live music, food and transportation from Sea Island to Village Creek. (Paddleboards will be available to rent.) This rain or shine event is open to the public but reservations are required and can be made by calling 1-855-572-4975 ext. 5111. Maybe Davis will help you with your paddleboard grip and stroke.